Although most girls have been dreaming of walking down the aisle in a fluffy wedding gown since their childhood, some women just want to marry their beloved men without all the pomp. If you don’t really feel like spending a year (or even more) in tedious planning, you’re probably suffering from anti-bridal symptoms! But, don’t worry, we’re here to present you modern wedding ideas that will help you deal with your upcoming big event! First of all, let’s talk about your wedding gown! Does it have to be white, formal or designer dress? You’re throwing an anti-wedding party, so you can pick out any style that suits you! It’s alright to avoid big name bridal shops, if the though of visiting them makes you break out in hives! Choose the dress that makes you feel comfortable and attractive! After all, it doesn’t have to be a dress at all! And, when it comes to that, what about “trashing the dress”? It’s an non-traditional idea more and more anti-brides like. In general, after the wedding, a bride chooses a photo shoot setting that will surely destroy the dress as she takes an adventure with her brand-new hubby. It can be really fun and exciting, plus you can make some wonderful after-the-big-day photos! Even though it sounds incredible to most brides, it’s possible to throw a wedding together in just a couple of months (or even weeks). This means you don’t have to spend a whole year planning every little detail. So, what do I suggest? 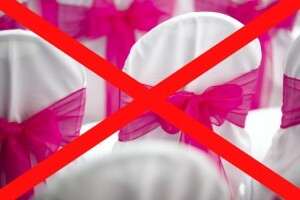 What about finding a decent venue that you and your groom-to-be can live with for the reception, ask a friend to be a DJ, if you can’t book any professional musicians on such a short notice and make the flower arrangements yourself? You don’t need to spend forever needlessly stressing over your wedding day plans, because you aren’t too concerned about the frills, right? If, however, you want your guests to be impressed and have an incredible party time, think about hiring a wedding planner who will understand your lack of desire for thrills and frills. A good wedding planner will surely manage to keep it simple and yet to organize a wedding day of your own anti-bridal dreams!